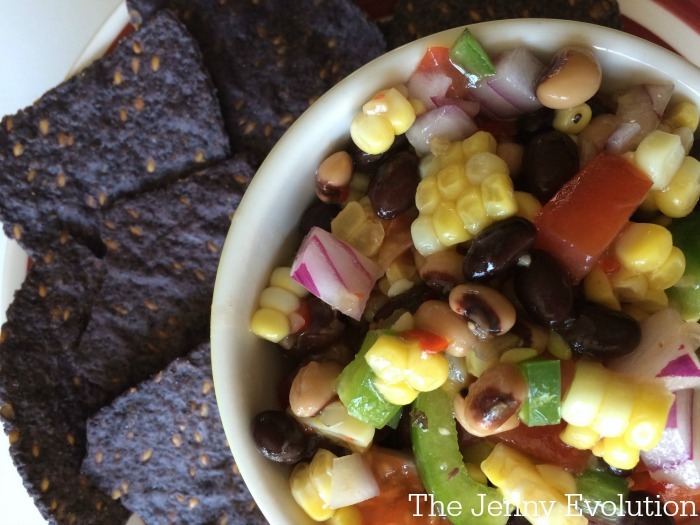 If you make ONE dish this summer or for the big game, it absolutely hands-down has to be Cowboy Caviar. 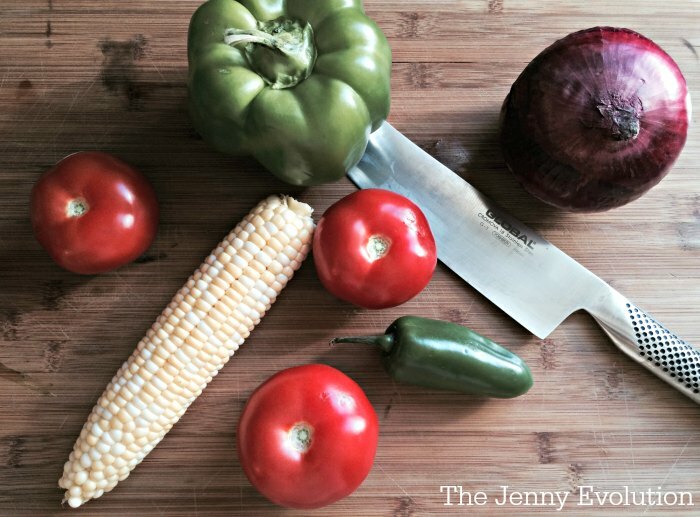 This spicy black bean, corn and fresh tomato salsa recipe is AMAZING with the right combination of sweet and spice. Last summer, I went to a gathering of friends in Central Colorado and one of the gals brought this dish to the party. People were actually using spoons to eat it, this stuff is so good. After much debate, we decided it needed an official name. And being in cowboy country, we quickly realized that this fresh salsa is nothing short of Cowboy Caviar. Thank goodness she was willing to share her recipe with me. And while this is a “salsa,” I’ll readily admit that this was my lunch this week. Yes, it’s that good! The key to this salsa, in addition to the right combination of flavors is to use fresh ingredients. 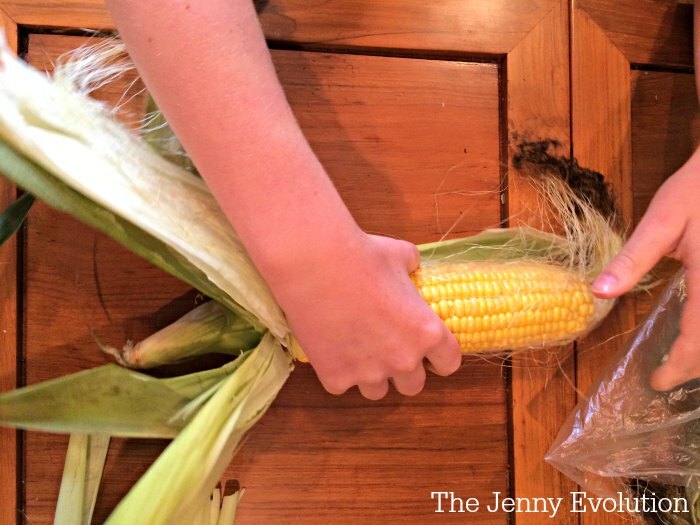 Personlly, we like to get the kids involved an husk that corn! What better sensory experience and wonderful way to connect your kids to healthy foods. 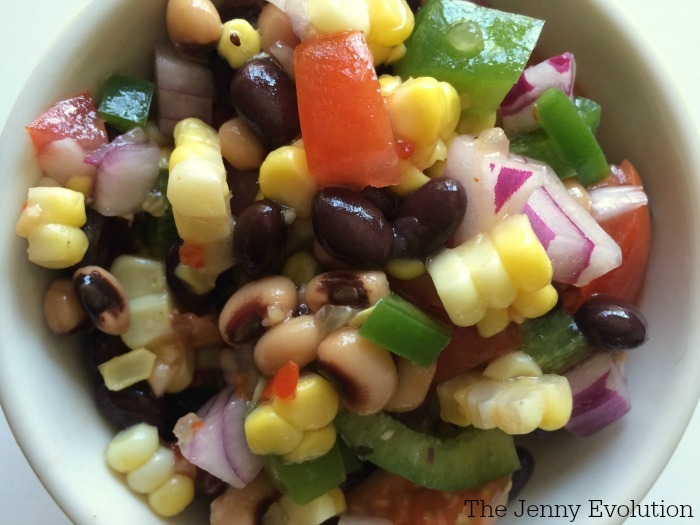 Gently combined the fresh corn tomatoes, black-eyed peas, black beans, onion, green bell pepper and jalapeno peppers. Season with salad dressing and garlic salt. Tip: For spicy salsa, keep the seeds from the jalapeños in! 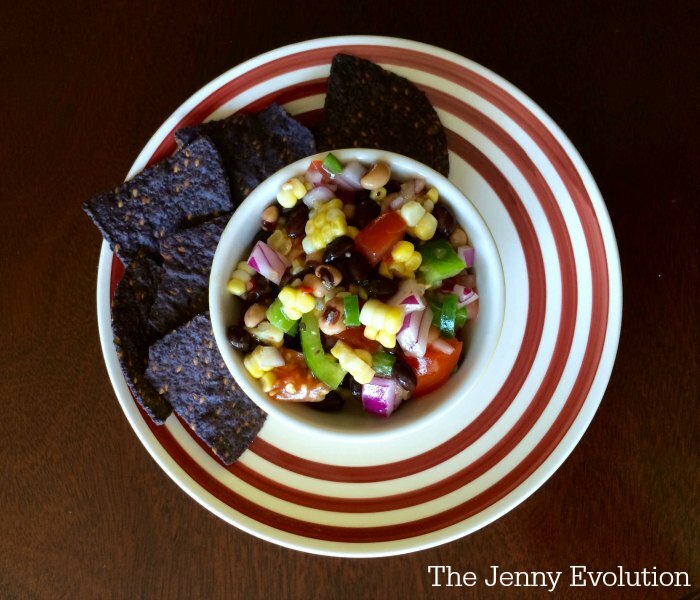 For more fabulously inspired recipes on The Jenny Evolution! I prefer to use fresh ingredients as much as possible... but I don't make my own black beans and black-eyed peas! Feel free to use canned items for these ingredients. But the fresher the ingredients for everything else, the better the taste! Yum! This is one of my all time favorites for parties, yet I never make it for myself. I’m going to pin this so I remember to make it. This looks so delicious and refreshing. I kitchen garden, so I will have fresh ingredients to use in my dish. I grow my own jalapenos, so mine will be hot! Thanks for sharing on Sunday’s Best linkup. Hope you will join again. This looks so good and it’s a great way to get in your veggies!! Thanks for joining us on Oh My Heartsie Girl Wordless Wednesday! It’s a sneaky way to get in your veggies. 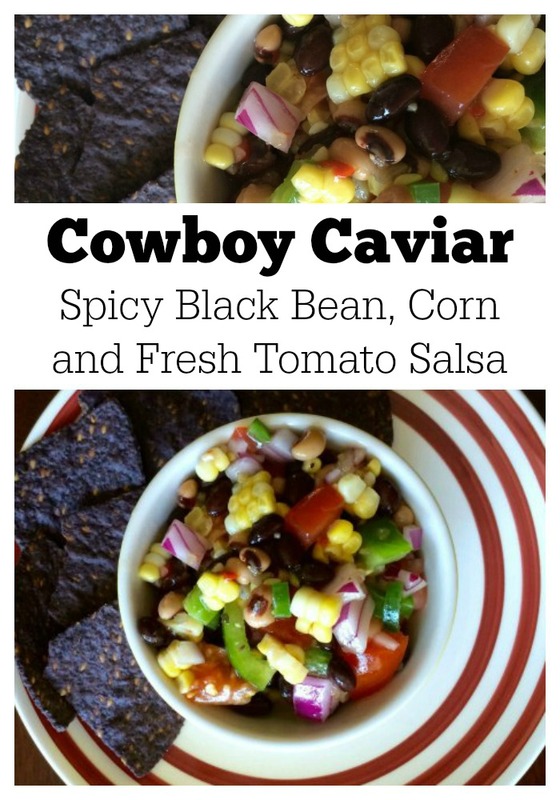 I made my Cowboy Caviar recipe again this weekend and people were scooping it up! 2 weeks ago I had some at a barbecue and they had gotten it from Costco. So happy to see now I can make my own! Thanks for sharing at the #HomeMattersParty. Hope to see you again Friday. Thanks for sharing your recipe–I want to make it right now! If it tastes half as good as it looks, it’ll be a keeper! I adore trying different kinds of salsa and this looks mighty tasty with the black beans and corn. Thanks for sharing on Creative K Kids Tasty Tuesdays. You had me at jalapeno!! Looks delish and thanks for sharing on Throwback Thursday! Trust me… make this once and it will become an absolute favorite! We love love this recipe, great for snacks and love it for breakfast, cause I just do!! This looks delish!!! Love it!!! 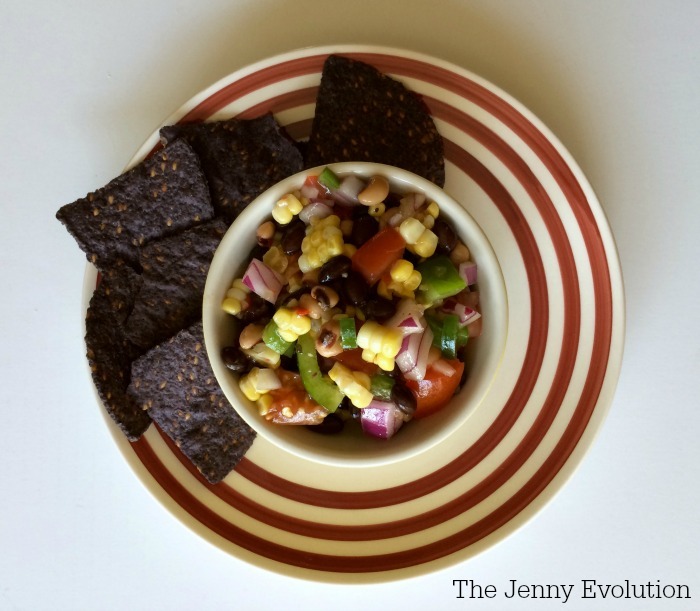 Thanks for sharing this amazing recipe, Jennifer!! !